The ambitious plans involve adding 55 new ones over the next five years, which will catapult the company’s number of rooms from 3,900 to 7,500, using an asset-light lease model. That is expected to push the total number of rooms up considerably under the Taj Group to around 25,000. Seven months after he took charge, Puneet Chhatwal, Indian Hotels managing director (MD) and chief executive officer (CEO), whose operating mantra has been profitability, kicked off an entire overhaul of Taj’s Ginger brand of hotels. While the past has seen the budget chain run into losses, Chhatwal’s take is the brand retains potential in the current environment. “It was ahead of its time as the Ginger model was not aspirational enough and got hit by changing economic tides,” Chhatwal says. “We are focused to get the positioning right before we scale up to 100 locations,” he adds. It will not be a budget play anymore and fall instead into the realm of ‘lean luxury’. 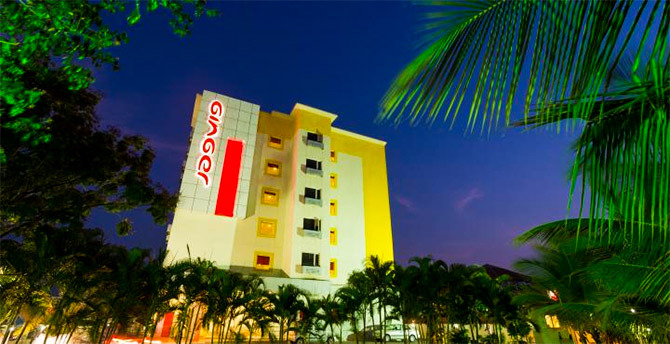 Ginger operates 42 hotels and will open eight new hotels over 18 months in locations near the international airports in Mumbai, Patna, Surat, New Delhi and others. The renovations at the old hotels will be complete in two and a half years and tariffs will range between Rs 2,500 and Rs 4,000. Deepika Rao, the new MD and CEO of Roots Corporation, the company that runs Ginger hotels, in her first interaction since being appointed, says two sets of changes are at play. Physical makeovers include a vibrant logo designed by branding company DY Works, changes to hotel interiors include modern air conditioners (window air conditioners were used earlier), full-service bars in select locations such as Goa, Jaipur, Bhubaneswar, Mumbai, and Puducherry, a lobby lounge equipped with a jukebox, iPads in the lobby for orders, and menus with in-house catering. The deeper change, she adds, is a structural shift to sticking to the operating lease model, which means no more self-owned properties. All older hotels will see renovation costs being borne by Roots Corporation, a 67 per cent subsidiary of Indian Hotels, and will run between Rs 600,000 and 800,000 a key. The new ones, whose room costs will be anywhere between Rs 3 million and Rs 4 million a key, will come from the partner owners in exchange for an agreement that includes Ginger paying anywhere between 20 per cent and 25 per cent of their turnover as lease rent. The point of all this? Pushing Ginger into the middle of the hospitality market above OYO and the guest houses, but below Lemon Tree, Royal Orchid, and Ibis, says Rao. Location, of course, remains, the more important metric. Sreedhar Prasad, partner with KPMG, says that to some degree it does not matter what you call the segment, but hotels in new business locations will prosper if land is acquired early enough. He cites religious tourism as an example. It is not just Tirupati, a traveller may visit Puri, Varanasi, and Shirdi as well. “When it comes to smaller business towns and cities, accommodation costs are usually borne by the company that is sending its workforce out. So, it is steady business for hotels,” he adds. Ginger’s management missed an opportunity to cash in on food and beverages (F&B) revenue by keeping service no-frills, offering only F&B through on-site Café Coffee Days, but will augment that in the future. A new menu will include basic popular choices like pizzas, burgers, and club sandwiches and will be driven in-house, Chhatwal adds. Partha Chatterjee, a former Taj employee, who was a part of the team that launched Ginger, says, “Ginger is moving out of the cocoon stage and may turn into a butterfly,” but cautions that competition is fiercer today than ever, with over 70 brands in the hotel space that charge Rs 4,000 or less for a room. Pride Hotels, Ibis, Royal Orchid, Sarovar, Accor, Hyatt Place, and Golden Tulip are just a few that have mushroomed over the years. There is also disruptive competition coming from Airbnb, online travel agencies as well as traditional outlets such as guest houses and service apartments. This leads to further questions. Should Indian Hotels not just do what it does best -- resorts, luxury palaces, and five-star business hotels instead of wagering on the other end of the pyramid? More importantly, why does Chhatwal think it will pay off? Growth has to come in many forms, he adds. “One cannot just bank on five or six hotels in major metros that generate Rs 3-4 billion each,” he says. It's time to check in to India!